Context: There are very few studies evaluating efficacy of platelet-rich plasma (PRP) in hair restoration and its combination with microneedling. As far as ascertained, there is no study to evaluate efficacy of microneedling with PRP plus topical minoxidil (5%) versus topical minoxidil (5%) alone in androgenetic alopecia (AGA). Aims: This study aims (1) to compare the efficacy of (a) topical minoxidil (5%) alone and (b) topical minoxidil (5%) + microneedling with PRP in men between 18 and 50 years with AGA Grade III to V vertex (Norwood–Hamilton scale) and (2) to perform objective and subjective evaluation based on clinical improvement and photographic evidence. Settings and Design: The study was conducted in the outpatient department of dermatology, venereology, and leprology in tertiary care hospital. It was open, prospective study. Subjects and Methods: Fifty patients with AGA were selected on the basis of inclusion and exclusion criteria. These patients were randomly divided into two groups of 25 patients each and were given following treatment: (i) Group A: topical minoxidil (5%) alone and (ii) Group B: topical minoxidil (5%) + microneedling with platelet-rich plasma (PRP). Statistical Analysis Used: Patients were assessed before starting the treatment and at the end of 6 months on the basis of (a) Patient's self-assessment based on standardized seven-point scale compared with baseline (b) Physician's assessment based on standardized seven-point scale of hair growth compared with baseline. Results: There was a significant improvement (P < 0.05) in both patients' assessment and investigator's assessment in Group B as compared to Group A at the end of 6 months. Conclusions: Microneedling with PRP is safe, effective, and a promising tool for the management of AGA. Androgenetic alopecia (AGA) or common baldness is the result of progressive, patterned hair loss that occurs when genetically predisposed individuals are exposed to androgens. There are very few studies evaluating the efficacy of platelet-rich plasma (PRP) in hair restoration and its combination with dermaroller. As far as ascertained, there is no study to evaluate efficacy of microneedling with PRP plus topical minoxidil (5%) versus topical minoxidil (5%) alone in AGA. To analyze and compare the efficacy of topical minoxidil (5%) alone and topical minoxidil (5%) + microneedling with PRP. In men, between 18 and 50 years with AGA Grade III to V vertex (Norwood–Hamilton scale). To observe untoward events or side effects, if any. Fifty patients with AGA were selected on the basis of inclusion and exclusion criteria. These patients were randomly divided into two groups of 25 patients each. Group B: topical minoxidil (5%) + microneedling with PRP. Patients who have not taken any form of treatment, at least in the past 6 months. 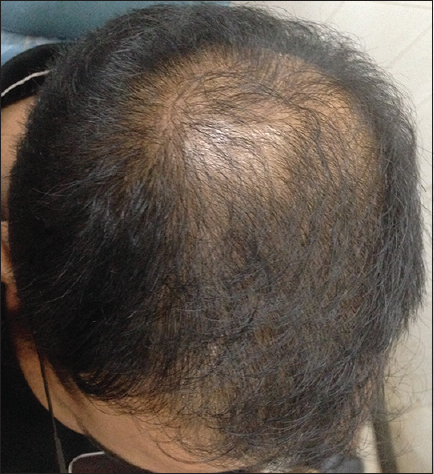 Patients with alopecia other than AGA, such as alopecia areata, alopecia totalis, telogen effluvium, anagen effluvium, and acquired cicatricial alopecia. Patients were instructed to apply topical 5% minoxidil in a dose of 1ml twice daily during the treatment period. Patients were instructed to apply topical 5% minoxidil in a dose of 1ml twice daily during the treatment period. They also received treatment in the form of microneedling with PRP once at the interval of a month for 6 sittings. Patient's self assessment based on standardized seven point scale compared with baseline which is shown in [Table 1]. Physician's assessment based on standardized seven point scale of hair growth compared with baseline which is shown in [Table 2]. 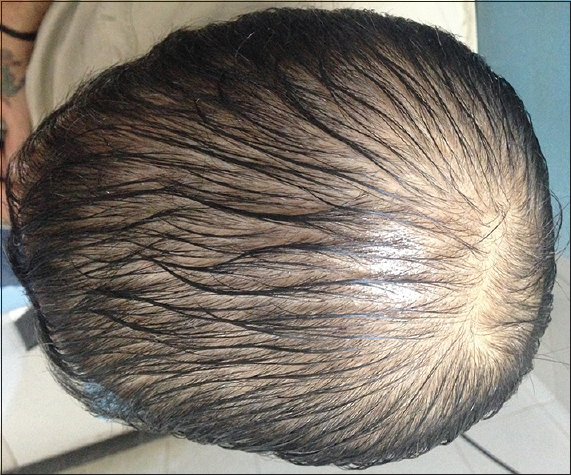 Hamilton–Norwood scale for male pattern hair loss was used, and subsequent improvement in the grading was noted. About 40% (n = 10) patients in Group A and 44% (n = 11) patients in Group B were in age group 21–30 years whereas 28% (n = 7) patients in Group A and 32% (n = 8) patients in Group B were in age group 31–40 years. Average age in Group A and B were 30.04 and 31.12 years, respectively, which were comparable, and difference was not statistically significant (P > 0.05) (Chi-square test). Nearly, 62% (n = 31) patients had hair loss duration of 1–5 years. 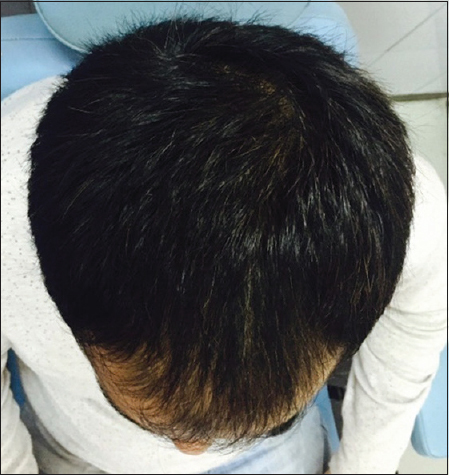 Maximum duration of hair loss was of 15 years, for three patients seeking advice. 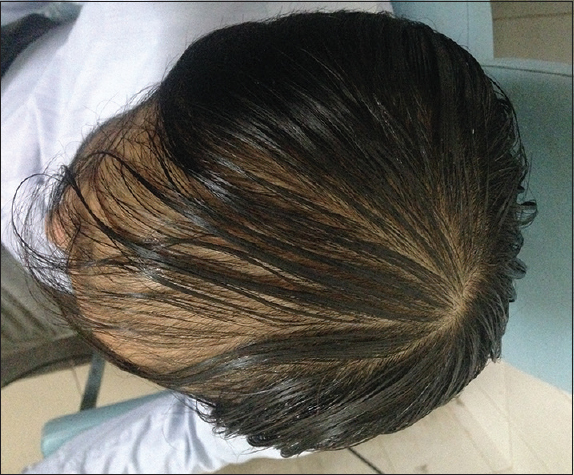 There was not much difference in duration of hair loss of the patients in both the groups. In the study of total fifty male patients, 25 (50%) patients had Grade III alopecia, and 16 (32%) patients had Grade IV alopecia. 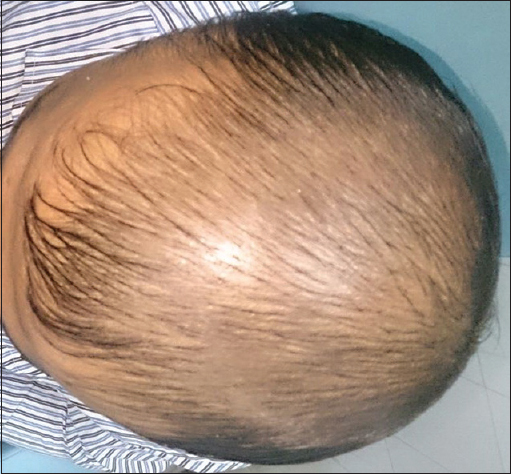 Maximum patients were of Grade III alopecia. Family history was positive in 54% (n = 27) patients in our study. As shown in [Table 3], there is a significant improvement (P < 0.05) in patients' assessment in Group B as compared to Group A at the end of 6 months. As shown in [Table 4], there is a significant improvement (P < 0.05) in investigator's assessment in Group B as compared to Group A at the end of 6 months. As shown in [Table 5], there is a significant improvement (P < 0.05 using paired sample t-test) in platelet count in PRP compared to whole blood. The results of group A are shown in [Figure 1], [Figure 2], [Figure 3], [Figure 4] and the results of group B are shown in [Figure 5], [Figure 6], [Figure 7], [Figure 8] which shows that there is significant improvement in group B patients when compared to group A patients. In a study done by De Villez, average age of patients with male pattern baldness was 36.9 years; while in a study done by Hajheydari et al., it was 22.8 years. In our study, average age of patients with male pattern baldness was 30.6 years. In a study done by Hajheydari et al., average time of hair loss was 23.10 months, while in our study, it was 54.54 months. In a study done by Krupa Shankar et al., 27.27% patients had Grade II alopecia, 22.12% patients had Grade I alopecia, 21.78% patients had Grade III alopecia, 10.8% patients had Grade IV alopecia, and 6% patients had Grade V alopecia. In our study, 50% patients had Grade III alopecia, 32%patients had Grade IV alopecia, and 18% patients had Grade V alopecia. Family history was found positive in 54% (n = 27) patients in our study which was more as compared to 48.5% positivity in Paik et al., study and less compared to 81.6% positivity in a study done by Hajheydari et al., Betsi et al., study finds that global pictures showed a significant improvement in hair volume and quality, which was confirmed by a high overall patient satisfaction in patients treated with PRP for hair loss. Dhurat et al. study finds that dermaroller along with minoxidil-treated group was statistically superior to minoxidil-treated Group in promoting hair growth in men. We could not find any studies comparing the efficacy of minoxidil plus microneedling with PRP to minoxidil alone. Greco and Brandt, Kang et al., Park et al., and Lopez et al. have shown that interfollicular injections of PRP (mesotherapy) produce significant increase in hair shaft diameter, growth rate, and hair density. Greco and Brandt  found that traumatizing scalp and infusing PRP into the scalp reversed miniaturization over an 8-month period when compared with control and signifi cant increase of 9.7% in average hair shaft diameter at 4 months and then 6.1% at 8 months in the treatment group was noted. The exact platelet concentration (in PRP) required to achieve hair regrowth is not known. It may seem that higher platelet concentrations are desirable but as suggested by Anitua et al., the “more is better” approach is not always the case. Supporting this opinion are the reports that high concentrations of growth factors transforming growth factor-beta, epidermal growth factor, and platelet-derived growth factor may contribute to impaired wound healing and increased scarring. The method used for PRP preparation in our study yields around three times the baseline platelet count. 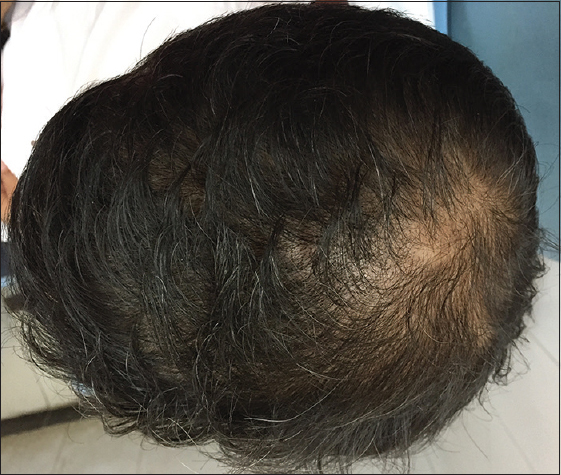 Significant increase in hair density was seen at the end of 6 months after treatment with PRP containing average three times of baseline platelet count. Further studies comparing efficacy of PRP in hair regrowth at different concentrations are required to know the exact concentration of platelet required to achieve optimum hair regrowth. Most common side effect in our study was pruritus in eight patients followed by seborrheic dermatitis seen in 7 patients and headache in six patients. In Tsuboi et al. study, headache was seen in 3%, pruritus seen in 1%, and dermatitis seen in 2%. Sinclair RD. Disorders of hair. In: Burns T, Breathnach S, Cox N, Griffiths C, editors. Rook's Textbook of Dermatology. 8th ed. Vol. 4. UK: Blackwell Publishing Ltd.; 2010. p. 66.16-66.31. Wadhwa SL, Khopkar U, Nischal KC. Hair and scalp disorders. In: Valia RG, Valia AR, editors. IADVL Textbook of Dermatology. 3rd ed. India: Bhalani Publishing House; 2008. p. 887-94. Paus R, Oslen EA, Messenger AG. Hair growth disorders. In: Wolff K, Goldsmith LA, Katz SI, Gilchrest BA, Paller AS, Leffell DJ, editors. Fitzpatrick's Dermatology in General Medicine. 7th ed. USA: The McGraw-Hill Companies, Inc.; 2008. p. 766-9. Vedamurthy M. Mesotherapy. Indian J Dermatol Venereol Leprol 2007;73:60-2. Escobar-Chávez JJ, Bonilla-Martínez D, Villegas-González MA, Molina-Trinidad E, Casas-Alancaster N, Revilla-Vázquez AL. Microneedles: A valuable physical enhancer to increase transdermal drug delivery. J Clin Pharmacol 2011;51:964-77. De Villez RL. Topical minoxidil therapy in hereditary androgenetic alopecia. Arch Dermatol 1985;121:197-202. Krupa Shankar D, Chakravarthi M, Shilpakar R Male androgenetic alopecia: Population-based study in 1,005 subjects. Int J Trichology 2009;1:131-3. Paik JH, Yoon JB, Sim WY, Kim BS, Kim NI. The prevalence and types of androgenetic alopecia in Korean men and women. Br J Dermatol 2001;145:95-9. Betsi EE, Germain E, Kalbermatten DF, Tremp M, Emmenegger V. Platelet-rich plasma injection is effective and safe for the treatment of alopecia. Eur J Plast Surg 2013;36:407-12. 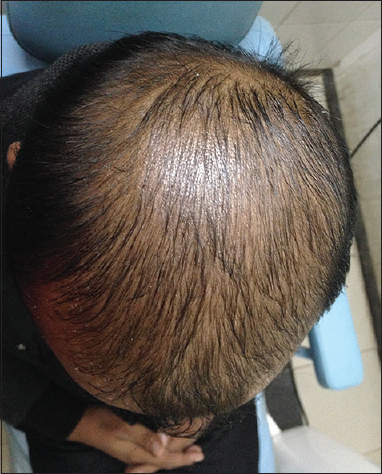 Dhurat R, Sukesh M, Avhad G, Dandale A, Pal A, Pund P. A randomized evaluator blinded study of effect of microneedling in androgenetic alopecia: A pilot study. Int J Trichology 2013;5:6-11. Greco J, Brandt R. The effects of autologous platelet rich plasma and various growth factors on non-transplanted miniaturized hair. Hair Transpl Forum Int 2009;19:49-50. Kang JS, Zheng Z, Choi MJ, Lee SH, Kim DY, Cho SB. The effect of CD34 cell-containing autologous platelet-rich plasma injection on pattern hair loss: A preliminary study. J Eur Acad Dermatol Venereol 2014;28:72-9. Park KY, Kim HK, Kim BJ, Kim MN. 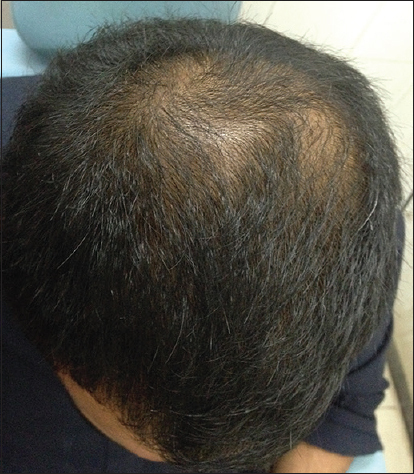 Letter: Platelet-rich plasma for treating male pattern baldness. Dermatol Surg 2012;38:2042-4. Lopez V, Vaya A, Bautista D, Ricart JM. Autologous platelet-rich plasma as a potential therapeutic tool in androgenetic alopecia. J Am Acad Dermatol 2013;68:SAB103. Anitua E, Andia I, Ardanza B, Nurden P, Nurden AT. Autologous platelets as a source of proteins for healing and tissue regeneration. Thromb Haemost 2004;91:4-15. Reese R, Edina DO. Autologus PRP: What do we know? Important concepts relevant to Hair restoration surgery. Hair Transpl Forum Int 2009:14-7. Tsuboi R, Tanaka T, Nishikawa T, Ueki R, Yamada H, Katsuoka K, et al. A randomized, placebo-controlled trial of 1% topical minoxidil solution in the treatment of androgenetic alopecia in Japanese women. Eur J Dermatol 2007;17:37-44.